Jindabyne is a country town located 463km south-west of Sydney. From Jindabyne it is another 35km to the resort of Thredbo, or 33km to the resort of Perisher-Blue. Jindabyne is a town with lots of shops, bars, restaurants & entertainment. It has 15,000 commercial beds, 2,000 local residents and 2 shopping centres including 2 supermarkets. There is no snow in Jindabyne (well maybe for about 3 days in every 2 years), Jindabyne is a rather plain looking place, apart from the lake which is scenic. Jindabyne is largely an accommodation base for Thredbo and Perisher-Blue. Staying in the actual ski resort is indisputably far far better than staying in Jindabyne, but staying in the resorts can be rather expensive. For this reason alone, about 60% of people skiing at Thredbo and Perisher-Blue chose to stay in central Jindabyne. There are other off-snow places to stay in apart from Jindabyne, but these are considered 'extra cheap' in the industry as they can be very boring and involve even more travel to & from the slopes each day. Beware of East-Jindabyne as it is often promoted as "Jindabyne"; it means an extra 20mins travel per day (10 each way) and it is very isolated. We offer you a choice to stay either "off-snow" in central Jindabyne, or "on-snow" in Thredbo. 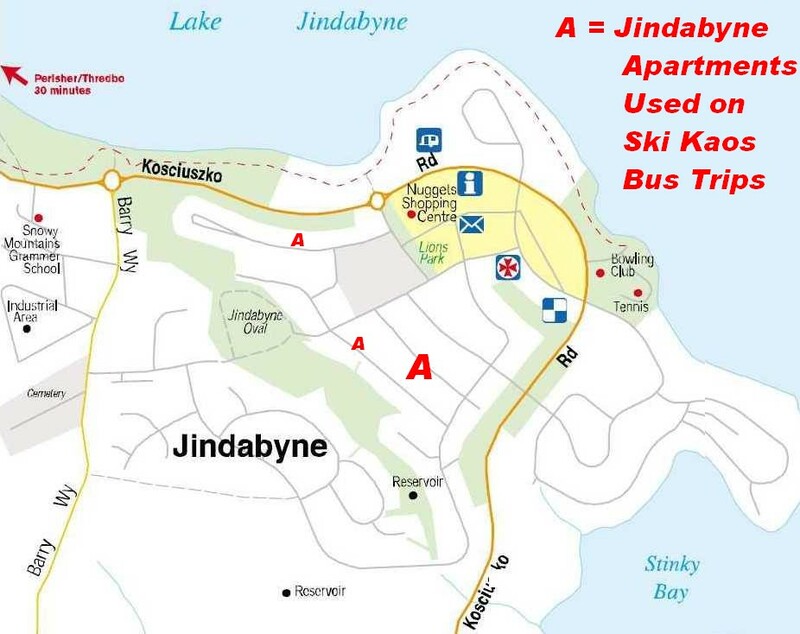 Ski Kaos' Jindabyne bus-trip accommodation is mostly at the intersection of Gippsland & Cobbadah Streets, only 600 metres from the shops and bars. Almost all of our Thredbo bus-trip accommodation is the main (central) part of Thredbo village.